The Willmore Wilderness Foundation spent forty days in 2014 clearing trail in the western portion of Willmore Wilderness Park. Elder Tom Wanyandie and Bazil Leonard, long–time outfitter mentored the youth involved in the trail clearing initiatives. Rehabilitation of the main Smoky River trail from the Sulphur Gates Staging Area to the Muddy Water River. – 15 km of moderate clearing required. Clearing the Muddy Water to Boulder Creek Trail through the 2002 burn. – 20 km of heavy clearing. Lots of downed burnt timber from the winter winds. Restoration of Boulder Creek Trail to the confluence of the Jackpine River and Bazil Creek. – 20 km of moderate clearing completed. Restoration from the confluence of Bazil Creek to Ptarmigan Lake through the 2009 burn. – 12 km of heavy clearing through the burn to Pauline Creek with lots of downed burnt timber. Moderate clearing from Pauline Creek to Ptarmigan Lake. Restoration from the mouth of Bazil Creek to the avalanche area, which is the beginning of the tree line on the trail to Morkill Pass. – 10 km of heavy clearing around the muskegs with a lot of downed timber. Restoration from the mouth of Bazil Creek on the south side of the Jackpine River to Fox Lake. – 12 km of moderate clearing completed. Restoration from the Muddy Water River to Sheep Creek Cabin. – 28 km of moderate clearing completed. 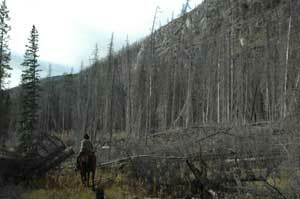 Restoration from the mouth of Sheep Creek Cabin to the mouth of Cote Creek through the 2009 burn. – 10 km of heavy clearing with lots of downed burnt timber. Lots of cutting through very old burnt trees with large diameters. After the 2014 trail-clearing initiative was completed, an early heavy snow came and flattened a lot of the trees over the trails that were just cleared. We managed to get out and clear to the Muddy Water River, but there will be lots of trail to restore next spring. • To do restoration and development of trails in Willmore Wilderness Park. • To restore historic trails which have been in neglect. For example to do rehabilitation of the trails on the upper Smoky River to link the Willmore Wilderness trails to those of Jasper National Park. • To GPS trail network. • To provide the public up-to-date information and education about the Park, utilizing the Willmore Wilderness Foundation office at 4600 Pine Plaza, in Grande Cache. • Create mapping of the trail network which can be downloaded from the website. • To put up professional signage in the Park to enhance visitor safety and appreciation of the Park. • To create educational multimedia to improve citizen awareness about the Park. Bazil Leonard, Tom Wanyandie, Logan Leonard, Kelsey Dozorec, Dale Belcourt, Fabienne Mooser-Kolly went out on a two-week trail-clearing expedition through the Smoky River and Jackpine River burns. The trail-clearing crews cleared from Kvass Flats to Ptarmigan Lake, which is about 50 km from Grande Cache. The burnt timber on Copenhagen Hill burned in 2002 leaving a lot of downed trees. From our base camp on the Jackpine River, crews cleared up Bazil Creek towards Morkill Pass. 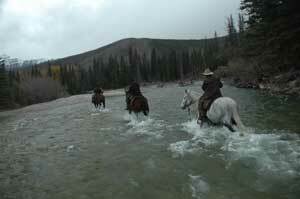 Finally the trail clearers went back down to the Smoky River on the south side of the Jackpine. To add insult to injury, crews literally cut their way back through the burn on the return trip to Grande Cache. We advise any travellers to pack a chain saw because trees are coming down with any wind. We will keep you updated. During the trail-clearing trip, Tom Wanyandie taught us how to prepare a porcupine in the wild. He says: “it’s my #1 meat”. It’s a tradition that he holds in high regard. Tom really enjoyed the meat. Everyone tried it but some found it too rich. This photo album shows the beautiful country from the Sulphur Gates Staging Area to the Sheep Creek Airstrip. It was a two-day trip with lots of cutting along the way. This photo album details the beautiful country we travelled through from Sheep Creek to Kvass Flats this fall, during the 2014 fall trail-clearing expedition. This is second-to-last chapter of the story detailing the Willmore Wilderness Foundation work to restore and rehabilitate the trails through the 2009 Sheep Creek burn. Clearing this trail will ensure that travellers can continue to access the Continental Divide region of Willmore Wilderness Park. 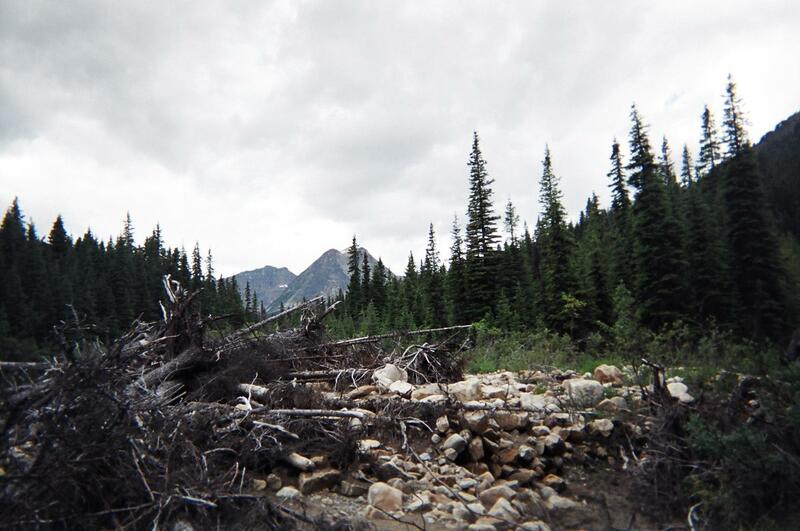 The good news is that Willmore Wilderness Foundation trail crews cleared 127 km this summer. The bad news--wet heavy snow brought down a great number of trees on the trail again.